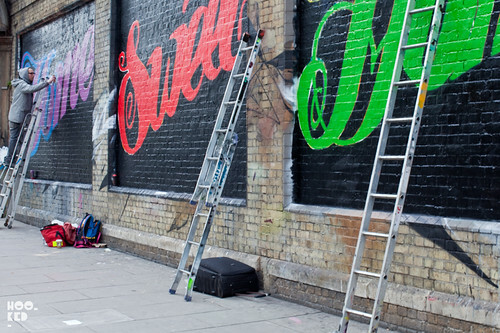 Earlier in the week Hookedblog caught up with street artist Ben Eine as he was hitting up the walls of East London's Village Underground with a large scale typographic piece he painting in support of Shelter's campaign Home For Londoners. "The campaign says that London is the best city in the world. But our housing is in crisis. There’s a desperate shortage of affordable homes for Londoners. We’re priced out of home ownership and we’re competing to rent run-down properties for astronomical prices. London’s next Mayor will get new powers to fix our housing. We say: London’s housing deserves the same commitment as London’s transport. We’ve got Transport for London. Now the Mayor must create Homes for London." 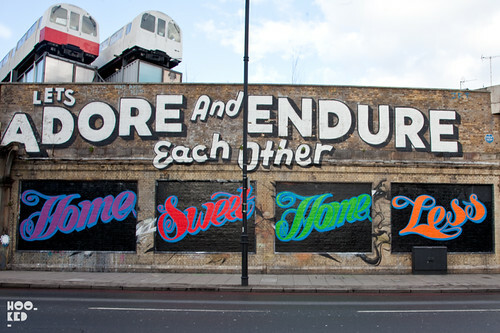 The finished Ben Eine wall which reads 'Home Sweet Home Less' is pictured above and below is a short timelapse video put together by Abbie Brandon of Eine painting this East London wall. not sure what the song. 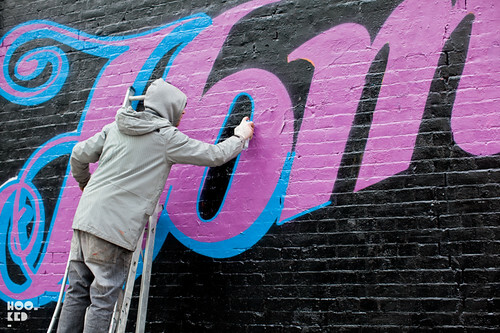 Suggest you post a message on the comments section of the vimeo wall and ask Abbie who filmed the clip.